And again.. Thank you so much Christina! I want you to know that meeting Stan back then was one of the greatest experiences of my life. He was very kind to me and his hospitality was outstanding. During the two months I stayed in Los Angeles I went to his place 10-12 times and each time we spent many hours together - he let me join inall the activities going on at the time, dinner parties, a Lakers basketball game, the movies, he even took me to an AA meeting. Every time I went there I would play a little for him and ask a lot of questions, which he tried to answer as well as possible - both the clever and the stupid questions! :) I am so grateful for having had this rare opportunity to get close to him and his wonderful personality and to understand more of his great musicianship! You know, the most important thing I learned from him was that as a musician you have to play 'you' and what I found was that all the qualities I heard in his music, I recognized in his personality as well - this gave such great meaning to me and has been a guideline for me all through my own musical life. A big thanks to you for honouring him with this site - I'm happy to get a chance to share with you, his closest family, the wonderful experience I had with him! 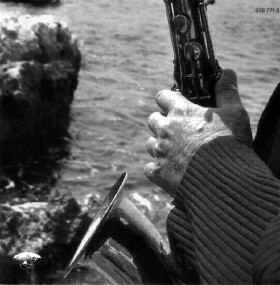 "The story goes that one day God announced he wished to play a musical instrument and so he choose the tenor saxophone because to him, it sounded closest to the sound of an angelic voice. An angel nearby hearing God suggested he listen to a Stan Getz recording which God did. After listening to a tune or two God declared that he had decided to shoose another instrument. When the angel asked God why he had changed his mind God paused, smiled broadly, and answered..."Because I have heard the voice of perfection". I had the pleasure of meeting this fine lady at Birdland recently. When she recited this story to me, I asked her to please send it in writing so I could share it on Stan's website. Thank you so much for sharing this precious memory Mrs. Sigman! The signed one of your Dad and me has an interesting story behind it that demonstrates a completely different side of him from the ‘bad boy’ side that we hear too much of. When I was a teenager, I had a good friend who was a press photographer. He had an assignment to take some pictures at a JATP concert in London. 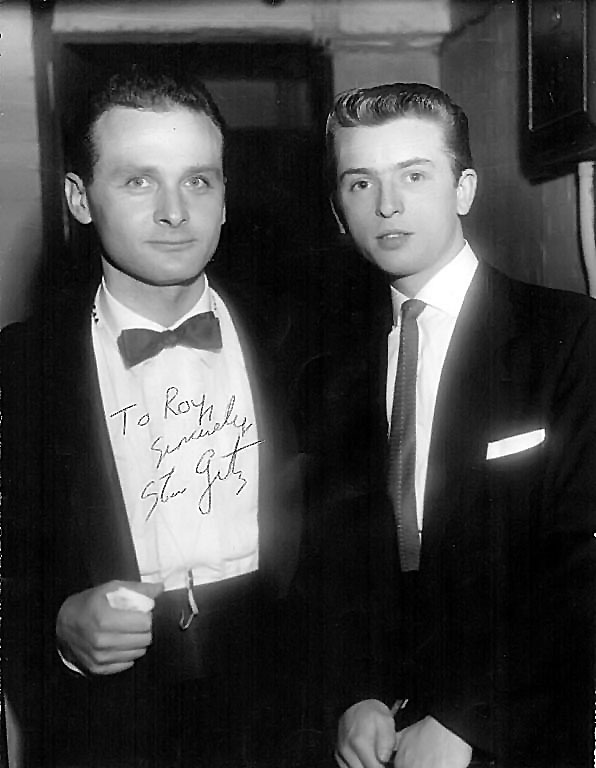 When I heard that, and I knew Stan Getz was on the bill, I pleaded with my friend to take me with him as his assistant or something (Stan was then, as now, my idol). He finally agreed and off we went to the theatre. After a while, after many pictures had been taken backstage, I saw the great man walking down the corridor. My friend than approached him and, before I knew what was happening, said to Stan “My young colleague here is a great fan and would like to have his picture taken with you. Is that all right?” “Of course, said Stan and indicated that I should come and stand next to him. I was so nervous and awe-struck in his presence that I literally couldn’t say a word. Stan put his arm round me and the picture was taken. I did think that the whole episode was going to pass with my being speechless and not saying a word to him, but I managed to pluck up courage to ask him a favour. When the picture was printed, would he sign it for me if I brought it to his next London gig in a week or two’s time. He said certainly and asked my name. A week or so later, I turned up at the stage door of the next London theatre (I can’t remember the name now) and asked if I could come in and see Mr. Getz. The Stage Door Keeper (like all SDKs) said that no-one comes in without an official pass. I pointed out that Mr. Getz had said that he would sign my photo. The SDK then asked my name and, when I told him, he said ‘Oh yes, Mr. Getz is expecting you – second dressing room on the right’! I was amazed and impressed that, after one brief meeting, Stan had remembered my name and had also remember to take the trouble to inform the Stage Door Keeper of my possible visit. I can think of very people indeed that would do that! I found him in his dressing room (with Dizzy Gillespie) and he was extremely kind and charming. I met him on a number of occasions after that and always personally found him very easy to talk to. (I did witness on or two occasions when he was a bit short with promoters, for instance, but that was only ever because, being a perfectionist, he wanted things to be right.). I hope this is of interest to you Bev, and that I haven’t gone on for too long! Doing an Internet search for something completely unrelated, I came across the following interview that was published in the New York Times, Sunday Magazine on June 9, 1991. We (family) hadn’t known that this was the scheduled publishing date for the article. Dad died on the previous Thursday, June 6th. I can still remember how I felt coming across this article just a few days later. I didn't like the article when I first read it. Perhaps that was because Dad and I had very recently discussed it when he was sent a draft sometime the month before. He was upset with me for a comment I made referring to "us" (the offspring) as "casualties of war". He knew what I meant by that and even agreed, but he was upset and feeling a bit betrayed by my comment. I think it had surprised him that I had said this, as I had always been his biggest and most vocal DEFENDER! But at that time, I had spoken just a small part of what was in my heart about growing up in the Getz family. I don’t recall being interviewed by Joe. I’m sure I must have also said many positive things… but of course the article was not about me and Joe used what he felt was appropriate and would fit into his story. When I read the article that Sunday, I understood why Dad had been saddened by my words. He knew he was dying. I hadn’t known. I was being told that he was still fighting the good fight… and winning. Needless to say, I was horribly guilty and sad that I had said anything at all that would be interpreted as negative. Recently, I read the article again for the first time in 17 years. This time I had a very different opinion. I realized that I haven’t considered myself to be a “casualty of war” for many years. I must have felt that way at that time, but that has long since faded. I suppose my view from this end (age wise), is that we are who we are… as a result of the choices we make. We don’t have much control over our lives as children, but we certainly do once we become adult enough to realize that it’s pretty much our own responsibility to be whom we are or how we choose to walk in our own shoes. I now don’t regret what I said in the article nor do I wish any of my childhood could have been different. I cherish all the good memories I have (and there are many) and I’m proud of my father, for all that he was, all that he accomplished in his life and for the beautiful legacy he left behind… under very difficult circumstances. Being children in that household certainly had its challenges, but being Stan was much more difficult and painful. I’m certain of that. I think whoever chooses to read the article will find it insightful. Thank you Joe Hooper! Very beautifully and thoughtfully written. Well it's difficult to say anything that has not been said before. I don't think I could say it better. Well it comes straight from my heart. "I never played a note I didn't mean"
This is just mind boggling. But the music is there for all of us to hear and it's pretty clear he didn't waste any notes. We are blessed with an incredible amount of music which astounds us at every listening. Everything is so logical and perfectly balanced and paced. The repertoire. Stan played the music he loved. Beautiful standards which are as effective today as when they were written. This is not a fad. He was true to this right until the end. The music always fresh. When I hear Stan with such players as Oscar Peterson it is music of the highest order. The interplay is so strong. The phrases complement each other. Aren't we lucky ? With all the videos available we can do the next best thing to seeing him live. I will pick one of so many, "I Can't Get Started" from a concert in Vienna. Even after so many listening I am still brought to tears. Finally I was lucky enough to catch him live. He was booked a whole week at a club in Montreal(Those were the days). Albert Dailey was on piano, Billy Hart on drums and most likely George Mraz on bass. I did walk backstage one night and we shook hands. He had such a disarmingly charming smile. However brief that moment was I will treasure it. Thanks Stan for being there and filling the void with the most beautiful music. It's like love on a special night. It's like something cherished that you'll never want to forget. It's like life is good and things are going in the right direction. It's like unison and harmony and improvisation that connects with the listener. It's all the things beautiful and harmonious. It's like a lot of the nice things we seem to have forgotten about through the years. It's like loving that first flower in May. It's like celebrating the Sunrise. It's like that feeling when you first catch the scent of the salt air. It's like softly as in a morning's sunrise. It's like that special feeling when you're literally lifted off the ground with joy. It's like Dear Old Stockholm. It's like all things smell good and taste good and feel good and sound good. It's like you and me and all of those wonderful memories embedded into the inner soul of our being. It's like being alive and enjoying every minute of the ride - even the hard times when it seems that nothing is ever going to work right. It's like accepting things the way they are and forgetting about trying to change them. It's like East of the Sun and West of the Moon. It's like bathing in scented water. It's like bathing in scented water with all of you. It's like being alive and screaming with joy if only just for that one reason. It's like not caring about the trivial matters that try to dampen our every day. It's like celebrating the joy of living. It's like a good pesto sauce on a hot July afternoon with a chilled bottle of dry, white wine. It's like a Stan Getz solo. Jesus, do I miss him. Stan Getz and I worked together for one week in October of 1984. Great guy, fabulous musician. We remained friends the rest of his life. I worked with Herb Ellis quite a bit from 1982-1992. During one of our travel times, we were talking about this person, that person while listening to one of my compilation jazz tapes. A Getz track came on, and I said to Herb, "You I know, I don't think I've ever heard Stan Getz take a bad solo." Herb looked at me and smiled, "Hell Rick, he doesn't have a bad solo in him." When I later re-counted this exchange to Stan, his cheeks flushed bright red and he said, "Did Herbie really say that?" As you probably know, even Stan Getz was susceptible to the demonic insecurities that plague all of us creative types. But for that moment, he was so happy, and so proud. 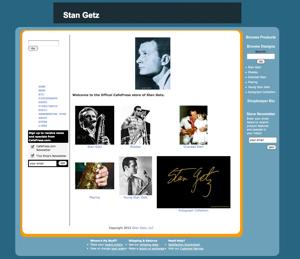 "No One Ever Said He Was Stan Getz"
Stan Getz Interviewed by Mel Martin. Reprinted from The Saxophone Journal Volume 10, Number 4 Winter 1986. This was my first of many interviews for Saxophone Journal and, to say the least, I really appreciated Stan's patience with me being such a novice. 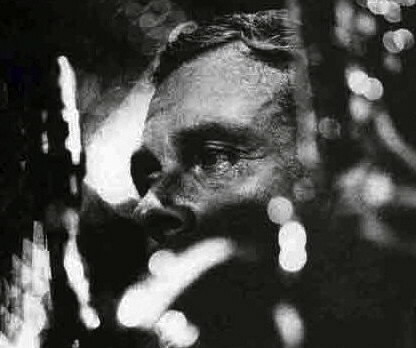 Stan Getz has been a major jazz soloist and bandleader for over thirty-five years. His sound on tenor saxophone is one so personal that he can easily be recognized from the first note. His playing style, which has been described as cool and effortless, has influenced scores of players, including the late John Coltrane. He has made countless recordings, among which are classics like the original Four-Brothers sound on Early A Autumn, and his Focus album with string writing by Eddie Sauter. Included among these has to be the Grammy Award winning Bossa Nova records, and countless other outstanding small-group recordings. Now approaching his late fifties, Stan still displays that youthful enthusiasm for the music, which has made him the "Dorian Gray of jazz." In this interview, he also reveals a master plan for jazz education, which will be put into action in 1986 as Artist-in-Residence at Stanford University. Stan's future recording plans cross so many boundaries in music as to be astonishing, including pending albums with his East Coast Quartet, pop albums with Kenny Rankin and Billy Joel, and a planned collaboration with Leonard Bernstein. We met, for this interview, at Stan's townhouse in Menlo Park in early October and were warmly greeted by Stan and his lady of four years, Jane Walsh, who receives much credit for helping him keep his life in order. 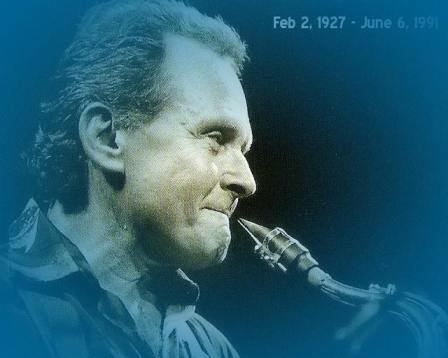 As a long-time listener of Stan Getz's music, I've also had the opportunity to get to know him on a personal level and work with him over the years. One such project was the most recently co-conducted master class in jazz at the summer 1985 Stanford University Jazz Workshops. Interviewing Stan proved to be the pleasure I had anticipated. The one question that is most important to me when I think of you and your music is your sound. Could you fill us in on how you conceived your sound and how you actually developed this concept? I never consciously tried to conceive of what my sound should be. I never said, ' I want this kind of sound!' I believe it was because of the bands I played with from the ages of 15 to 22. The first one was Jack Teagarden, who we all know played trombone, but his sound was so great, so...(pause) sort of legitimate, and effortless. I never tried to imitate anybody, but when you love somebody's music, you're influenced. Then I was with Benny Goodman when I was 18 and I believe his sound had an influence on me; such a good sound that he had in those days, you know? And, in-between I heard Lester Young of course, and it was a special kind of trip to hear someone like Lester, who sounded so good and almost classical in a warm way. He took so much of the reed out of the sound. I really don't know how I developed my sound, but it comes from a combination of my musical conception and no doubt the basic shape of the oral cavity. I did always try to get as much of the reed out of the sound as I could. You mean, hear more of the reed? No, just the opposite. I always wanted to take as much reediness out of the sound as I could and hear more of the breath. I came from an era when we didn't use electronic instruments. The bass wasn't even amplified. The sound was the sound that you got, and I discovered that my dark sound could be heard across a room clearer than somebody with a reedy sound. It had more projection. My sound always seemed to fill a room. I also did a lot of practice in the Hollywood hills in the open air. That's God's sound! I appreciate men like Ben Webster and Coleman Hawkins very much, but I just don't like a reedy sound. I have to work hard to get my sound because I use a harder reed (med-hard Van Doren). People think that I play effortlessly. I remember doing a record date with Bill Evans and afterwards he said to me, you make it sound so easy but when I get right up next to you you're working hard and making it sound easy! Your sound just seems to float, especially on a ballad. Could you clarify how you go about working out a tune or song and how you find them to play, as well as develop them for performances? I practiced saxophone eight hours a day for the first two years I played. But, I never practiced after that because I was always out on the road working. The only time I take out the horn, other than work, is to find a new reed. But, in my mind, I'm always hearing things. Jane sees my fingers moving in meditation and she knows not to talk or disturb me. That's what I call the 'alpha state.' That's a state of relaxed concentration and effortless creativity. It comes off the top of my head. As far as choosing songs and tunes, I don't write music so I just choose what I like to play. Does not composing your own music sort of free you as a performer? I often think it's a bit of a curse to have to play one's own compositions and especially at times when that particular selection might not be appropriate but it's yours and there is a commitment to perform them. I've always regretted the fact that I've never formally studied and learned the mechanics of writing music. I don't know if it frees me, but it's a pain in the neck to have to depend on others to write things, or if I have something in mind and am barely able to tell someone what to play behind me. Most musicians seem to be able to follow me because I've learned enough chords to be able to play them without even knowing their names. I've heard you play some very complex stuff like Chic Corea heavy duty changes. Are you saying you don't analyze chords, but instead simply play them by ear? I try to throw the changes away after I've looked at them and play by ear. I don't believe in playing over the changes, which I may do a lot, but I don't like it. When I'm really free, I like to play totally by ear, knowing the basic structure of course. It's like forcing yourself to let go so you don't use a chart as a crutch. It's the biggest single problem I encounter with private students on saxophone, at workshops, and for that matter, at jam sessions. In the jazz program at Stanford, students won't be taught just from a book. They're going to play with other good musicians and will have to use their ears and memorize songs. They don't have the foundation we had. Life is too full of distractions nowadays. When I was a kid we had a little Emerson radio and that was it. We were more dedicated. We didn't have a choice and we didn't have big allowances. I got out of the Bronx by taking that saxophone in a room eight hours a day and playing it! Now there are more distractions like movies, video, and sports. Early on we made records to document ourselves, not to sell a lot of records. I still feel that way. I put out a record because I think it's beautiful, but not necessarily commercial. I remember being assailed by the wife of a famous trombonist after receiving eight Grammies for a record that I thought was just beautiful. She screamed, 'you turncoat, you went commercial.' I thought the Bossa Nova music was just beautiful music. I didn't care if anybody thought it was commercial. Commercial can be a good word too. It means getting to a larger number of people. Records used to be documents but now record companies want 'product.' They want to sell a lot of records and guys want to get famous. I never thought about being famous or having a band. I just wanted to play music. What are your future plans for recording? Kenny Rankin was over here recently and I like what he does. We might make a record. I like some of the tunes Billy Joel writes and some of his tunes are very nice. I found out through his manager and my lawyer, who are friends, that we admire each other, so we're going to make a record. I have an East Coast rhythm section comprised of Kenny Barron, George Gray and Al Foster that I'm going to make a quartet record with. Do you have a label in mind? I don't make records for labels anymore. If I have something I want to do I go in and play it for the president of a company and if they get enthused, that's it! Have you any other projects in mind ? Leonard Bernstein is writing a piece for me. On his 50th birthday he was asked by Shirley McClaine and Eddie Adams what kind of music he wanted, and he said he would like Stan Getz and Eddie Sauter to play music from Focus. So they flew us out to the Beverly Hills Hotel and we played Focus for him. Recently, I was in Israel playing a benefit for a children's hospital in Jerusalem and Leonard Bernstein was performing with the Israel Philharmonic and I went backstage to see him. He said, 'it's time I write something for you.' He's so great! That man is just brilliant. So that's about it as far as future plans. It's wonderful to hear that there'll be a project inspired by 'Focus.' It's one of my all-time favorites and one of the only albums where a great jazz player was able to maintain a personality and truly improvise with written strings. Could you tell us about those sessions? I always liked the Sauter/Finnegan band. I sat in with them once and I loved the arrangements. When Verve was sold to MGM, I was asked to pick a project, so I picked Eddie Sauter to write something. I didn't want rearrangements of tunes, but instead I wanted him to come up with something interesting because he knew my playing. When you work with a good composer you don't tell him what to write. If he knows your playing he'll do what he thinks is right. After nine months Eddie had this idea and it took three weeks to write it out, and that's how it came about. How many takes did you do? Two-thirds of it was done with earphones. The tracks had already been recorded because my mother had died the week it was to have been recorded and I was unable to finish the project at that time for obvious reasons. I'm Late and one other tune was recorded live. The rest were taped and a few months later I overdubbed the saxophone. I'm not a many take guy. Each time it seems to get more stale to me. Usually it's the first time because I get tired of hearing myself. That's the whole thing you're taught in jazz, the spontaneity of it. That's what I really love about jazz. Your bands have always had outstanding young musicians in them.. How do you go about finding these players? I used to go out and hear players but after I got a reputation for giving a lot of solo space to developing young players, such as Horace Silver, then people would come to me. Plus, when you have a good band, if somebody leaves, you ask who the others would like to play with and if our tastes agree, I tend to go with that. Who is in your West Coast band? Right now I'm using Larry Nash from LA on piano, Bob Harrison on bass and John Guerin on drums. What classical music do you listen to? I find something good in just about all classical music. I just heard Bernstein do Mahler's Ninth Symphony at Davies Hall. It's so great. I just like all the classical composers. I don't listen to much jazz, mostly classical music. There's only a few so-called classics in jazz that I want to go back and listen to. What would those be? Miles. Those classic Miles dates like Kind of Blue, and Round Midnight with Philly Joe Jones. They're just tremendous jazz classics! And of course, I've listened to Duke Ellington a lot. But there is something refreshing about so-called "classical music." You can play a classical record in the morning and it purifies your soul (laughs). It's almost religious. Have you done any video as of yet? I made one at the Mondavi Winery. It's now in the process of being sold. Do you feel that video will ever really open up for jazz artists? I don't know. It seems like it won't, considering MTV and such. But, there was an article in USA Today talking about jazz on MTV and the author stated that he wouldn't want jazz on MTV, except if there was, and I quote him, "a Charlie Parker or Stan Getz video without gimmicks, he would buy it." So maybe once in a while they could show some jazz. Did you do much TV work earlier in your career during the 50s and 60s? It wasn't that much, but I must have been on the old Steve Allen Show a dozen times. It's not a good medium for the music because of camera rehearsals, but I enjoyed working on Steve's show. He had a director that's now very famous. Dwight Hemion, who at that time seemed to understand that you don't rehearse jazz to death to get the camera angles. He would just show it as it was. My brother Bob was the producer of the Mondavi video. He's the creative director and producer for public TV (PBS). He used no special filters, just the beautiful afternoon, the people and the music. What combination of mouthpiece and reed are you currently using? I believe you mentioned using a med-hard Vandoren reed. I'm using an old Otto Link rubber mouthpiece. It was a 5 * but it was worked on by Ben Harrod. Otto Link had sold the company to him and some of the best Links ever made were made by Ben. He's retired and now lives in Ft. Lauderdale, Florida. He's very good and is also a musician and an honest man. He's refaced it for me. I'm uncomfortable with a rubber mouthpiece. It's too big. Every time I try a metal mouthpiece I wish it could work for what I want. But I use rubber mouthpieces because they afford me what I need. I like to hear the brass vibrate in the sound, not the reed. Like I mentioned earlier, I like a dark sound, which is contrary to what just about everybody else is looking for. One of the drummers I was working with (Billy Hart) had also worked with Joe Henderson. We were working in Chicago and I wasn't using a mike. He said, "I thought Joe would have a big sound and you wouldn't, but it's just the opposite. Your sound is much bigger." So what is miked is not necessarily the sound. When you recorded the ''Poetry" album with Albert Dailey, did you use a minimal number of microphones? We only used two mikes. It was recorded in my studio, which I had built on my estate in New York. It is built of all wood, with window views out in the country. It has a high ceiling and we used two B & K calibrated mics, one on me and one on the piano, which went directly into a modified Studer two-track. No mixing board was involved. I guess that's why engineers and boards came into being because musicians forgot how to blend themselves. That's why so many use monitors now. We used to play so that you had to listen to each other and mix your own thing on the spot. You had to hear everybody more than yourself. Then vocalists would need some reinforcement and that's when sound boards came in. Symphonies are recorded with two mikes and Benny Goodman made all those great records with one or two mikes. Musicians used to mix themselves! That has become a lost art! It is and it's a reflection of their musicianship. Maybe it's a combination of the use of electrical instruments and playing larger venues. When you record, if you use two mikes properly positioned, it will sound like your two ears are in the room with the musicians. There are some engineers who don't understand how to record acoustic instruments because they want everything to sound as if it's in your face. Do you generally mike your horn from a distance? I stand far from the mike and I try not to use one if it's at all possible. Sometimes we mike the piano a little and of course there's the bass amp. I have to use mikes to balance with where the drummer is at. You start with the drums. There are lots of places, however, where I don't use a mike like Fat Tuesday's, Blues Alley, and the Old Keystone Korner. You learn how to project your instrument and think projection, Try to see the corners of the room. You don't have to play louder, it's just a certain center to the sound that you can get going through the room. It's not loudness but sound, and brass vibrating, or resonance without reediness. I've walked around the room when you've played and your sound does indeed permeate every corner. You get it from playing outdoors a lot. I heartily endorse playing in the open air. When I was a kid in the Bronx, we lived in a tenement building, where all the houses were right next to each other. In the summer I would to into the bathroom to practice with the windows open and it was all tiles and echo. Then somebody would yell, "shut that kid up !, " and my mother would say, "play louder Stanley." (laughter) When I left Jack Teagarden I moved to Hollywood and would go up into the hills with bass and drums and we would play for hours. It was a ball! I don't think there is the same kind of dedication among younger musicians that we had. I was married at nineteen and had a kid at twenty, and then two more, and I had to work a lot. But I always went to the jam sessions afterwards. I played in rhumba bands, mickey mouse bands; all kinds of bands. But after the job we would jam all night. We just had a different kind of dedication than kids do today. Although, they have records to jam with, but it's not the same thing. Interaction is what jazz music is all about. That's what I'd like to see happen with the jazz program at Stanford. You can read all the textbooks and listen to all the records, but you have to play with musicians that are better than you. What needs to be done is to simulate the atmosphere of a club. Maybe a place in Palo Alto where four nights a week, under supervision of the teachers, the students can play under actual conditions. That, plus take the big band on tour to Montreaux and other festivals. There's a way to train young jazz musicians without having to go on the road. In the traveling academies I was with, I learned many things, more than playing music, some of which I regret (laughs). But there's a way to get kids interested. But every teacher must be a great player. What are some other prerequisites that you need in order to work with young jazz musicians and develop them? First of all, I would need time. The summer programs can be very frustrating. It's over just as you get going. You need more time; maybe fours years in college. Guys come on my band for three or four years and they learn. But at Stanford I wouldn't have it be all music. I would have people like my music business lawyer Elliot Hoffman who is a genius and handles people like Pavarotti, Cindy Lauper, Dizzy Gillespie, etc., come and lecture. Somebody who could teach these young people how to avoid the pitfalls I went through. I'd have sound engineers, people that could talk about acoustics and sound recording, come to speak. I'd record the kids and show them the difference between how I sound and how they sound. I'd give them something to aim for. I'd coach every instrument, including singers and rhythm sections. One of my piano players told me that every rehearsal with me is a lesson, so why not do the same thing in school. A certain amount of study, including reading and writing music, is necessary but you need to play and play a lot! The program at Stanford is developing and has been funded, and will begin January Ist, 1986. 1 think Stanford can draw students from all over the world. People get grants from various countries and then go to New York, getting the best musicians and spending all their money on a recording. It would be better spent by coming to Stanford and enrolling as part of a structured program. Like, for example, the computer programs at Stanford. People come from all over the world because they're interested in learning the computer. That raises an interesting question. Have you been involved in any way with computers in your music? I did a concerto at the Frost amphitheater at Stanford last summer. It got awfully lonely up there, playing with four speakers (laughter). You couldn't tell anybody in the band a joke. Everything was programmed. They can sound like a full symphony orchestra, plus anything the composer wants. The piece was written by Dexter Morrow, who is a computer professor at Colgate. What he did was to take my solo on Early Autumn, plus having me play before he wrote it. Some of it was worthwhile, but it was lonesome and no interaction. Although, I was glad I did it and may do it again. Would you like to say something about your very famous saxophone repairman, Emilio Lyons? We were talking about musicians that came from a different era, people that were craftsmen and artisians. I met such a man in Boston years ago who is a good clarinetist. Somebody asked him to repair my horn in an emergency. He was so nervous at the time that he was trembling. Since then, he's become the finest saxophone repairman in the world. They call him the "Saxophone Doctor." When he overhauls your horn you won't have to see him again for at least three years. He coats the pads with something and they never waterlog or split or leak. He just spends hours at it. See this flower on my horn, it's not just a cork, it serves a practical purpose with style. He's a guy that cares and he comes up with things like the cork extensions on the palm keys. I would have never thought of that. What would you like to say to all the saxophone players reading this interview? Switch to piano! No; really, if you like an instrument that sings, play the saxophone. At its best it's like the human voice. Of course, it would be best if you could actually sing with your own voice. The saxophone is an imperfect instrument, especially the tenor and soprano, as far as intonation goes. Therefore, the challenge is to sing on an imperfect instrument or "voice" that is outside of your body. I love that challenge and have for over forty-five years. As far as playing jazz, no other art form, other than conversation, can give the satisfaction of spontaneous interaction. A good quartet, listening closely to each other, is like a good conversation among friends interacting to each other's ideas.